Njami has invited six international curators – Nadine Aimé Bilong (Cameroon/France), Orlando Britto (Canary Islands), Valentina Gioia Levy (Italy), Solange Farkas (Brazil), Sujong Song (Korea), Sumesh Sharma (India) – to present a selection of artists from various geographical locations in the world. Italian curator, Valentina Gioia Levy, has been interested in the Asian art scene and the relational dynamics between East and West for years. She has excepted Njami’s invitation to “re-enchant the world” through a reflection on the relationship between the visible and invisible, the body and spirit, real and virtual space. The Witnesses of the Invisible, the title of her selection refers to an expression used by the French philosopher Jean-François Lyotard that during his historic exhibition at the Centre Pompidou in Paris, Les Immatériaux (1985), identifies artists as those who are able to interact with the intangible and give it shape. On display are the works of: Chai Siris (Thailand), Emo de Medeiros (France/Benin), H.H.Lim (Malaysia), Stefano Canto (Italy). For the African Biennale, Chai Siris has produced a new work with the support of the Ministry of Thai Culture, He Waits 500.000 Years for this Song, in which the artist explores open-air cinema, popular places in the period of his childhood and now completely unused except for curious religious purposes. In some rural areas, in fact, these now abandoned cinemas are occasionally reactivated by local people to entertain the spirits and receive grace. 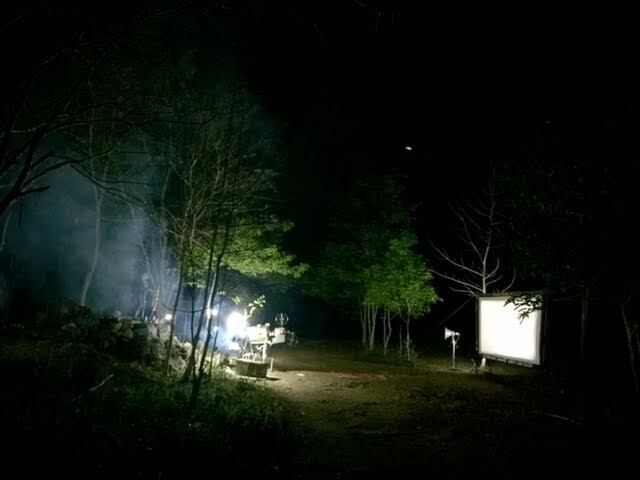 Siris decided to project a film for the spirit of Homo Erectus in Lampang, whose remains found in the homonymous region in the north of the country have become an object of worship by the local population. His work is a reflection the planned obsolescence of technologies and the less planned obsolescence of popular beliefs, but also an attempt to reactivate and bring to life both through action that is artistic and mystical at the same time. Emo de Medeiros, Franco-Beninese artist who lives between Paris and Cotonou, will present his Surtentures, tapestries that recall the ancient textile art of Benin, where traditional decorative motifs have been replaced by contemporary linguistic symbols as elements of the desktop signs or icons. Microchips that can send messages to smartphone oweners through bluetooth technology are hidden in the tapestries. Like Siris, de Medeiros also questions the relationship between man and the invisible forces that drive the world at a time when they are no longer the oracles which provide answers to our questions but rather these answers are provided by Google. For his installation Living Room, H.M. Lim has collected hundreds of images from the web of ruins of cities destroyed by bombing from various parts of the world, from the Middle East to Africa. These pictures that continuously reappear on our screens contributing to the spread of an attitude of indifference and trivialization of evil, are used by the artist to create a piece of cloth with which to dress a living room as well as create a friendly atmosphere in which visitors will be invited to stop, rest and discuss. Finally, Stefano Canto has produced, with the collaboration of choreographer Ashai Lombardo Arop, a work that combines visual art and dance. The artist creates a series of concrete and steel sculptures that invade the exhibition space of the museum like skeletons from destroyed cities, while in the course of a performance, a group of dancers directed by the Afro-Italian choreographer interact with them using them as an original imaginative device. In this work, it is the body that defines the architecture. The movements of the dancers complete the structures and architectures draw in the air reminiscent of Le città Invisibili by Italo Calvino. For more information on the Biennale of Dakar and the selection of curators and artists, follow this link.